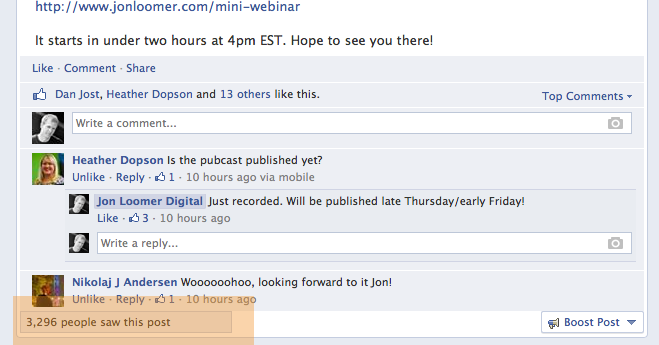 Facebook marketers are a demanding bunch. That’s fine, unless we’re unreasonable. In the case of micromanaging the Reach of individual posts, we are being completely and insanely unreasonable. Part of this is Facebook’s fault. Part of it is due to an old thinking hangover while more advanced strategies have evolved. And some of it is due to pure ignorance. If you can’t tell, I’m beyond annoyed by the Reach topic. I was annoyed more than a year ago when it was the reason of the day to revolt against Facebook. And I’m well past exhausted these days. Reach is only one small, peripheral metric that means very little in the grand scheme of things. And the way most of us are using it is completely wrong. 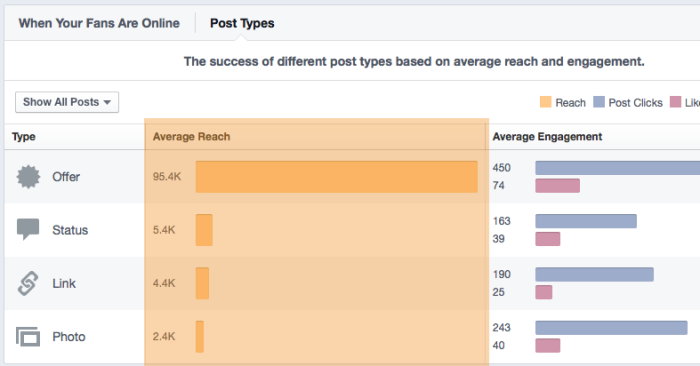 Ask the typical Facebook marketer what metrics they follow, and they’re bound to mention Reach near the top of the list. Why? It’s displayed on every post. You don’t need to go into Insights to see it. You don’t need to download an export. And you see it in real time. We can’t ignore it. We’re obsessed with Reach to the point that it paralyzes and manipulates us. We micromanage the hell out of it. And whenever that number dips, we freak. So many reasons. Where to start? First of all, we need to understand how Facebook works. The typical user could get 1,500 stories in a given day, but Facebook only shows 300. So that would be the 300 stories from the friends and brands that a user interacts with most. Based on my recent experiment, I saw 106 organic brand stories in a 24-hour period. That’s a lot. And they came from 38 brands. They became preferred because I interact with them in some way. You’ve gotta be good to break into that 300. You’ve gotta be real good. And since the user base is constantly growing (now at 1.19 Billion) and more active than ever, competition increases on a daily basis. Oh, and did I mention more brands are jumping in on a daily basis as well as advertising more? Facebook needs the News Feed to be a good user experience. And you can’t doubt that they’re doing something right given how insanely active it is. They’ve tested a filtered Feed vs. a non-filtered feed (countless iterations), and the current version results in the most engagement. Live with it. That’s the way it works. But beyond the filtering, you can’t reach everyone. You can’t reach close to everyone. Only about half of your Fans are online every day. And if you post once, you’re only going to reach the small percentage who were on during a two hour window or so. You’re angry because you aren’t reaching more than 5% of your Fans? Or 10%? Or sometimes more? Do you know what percentage of followers you reach on Twitter with a single tweet? But we also wrongly assume that the Page Like means that a user wants to see everything we post. This is complete bull. I like a few hundred Pages. Mainly because I like a musician or movie or TV show or product. I couldn’t care less if I ever saw a post from them. And that’s the way the typical user feels. Not the marketing user like you and me. The typical user. We’re unreasonable because we assume everyone wants to see our stuff. And they want to see every post by every brand they’ve liked. And apparently, they even want to see every post they missed when they weren’t online. 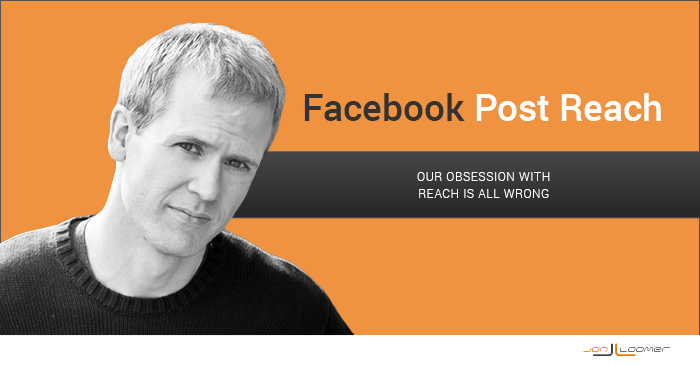 This is Facebook’s fault because Reach is a metric in the first place. They don’t have to make it so obvious how many users we reach with each post. They don’t have to make that data available at all. But they do. Not only do they make it a metric, they make it THE metric. You can’t avoid it. 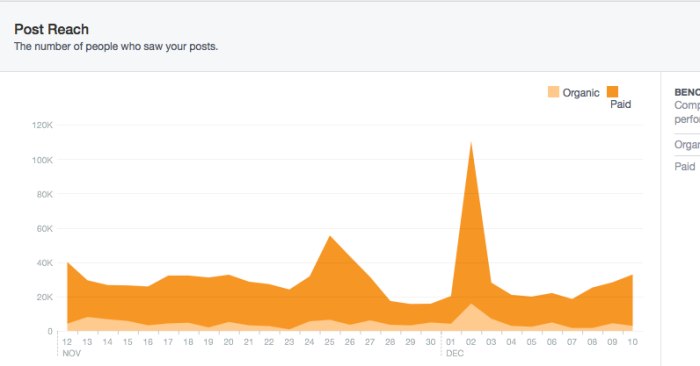 Facebook convinces you it’s important by making it the focus of nearly every chart and graph. And this doesn’t even mention the dozens of times Reach is mentioned in the export files. It’s a risk on their part. While it can be motivation for advertising, it’s also the source of an awful lot of confusion, outrage and unreasonable expectations. Twitter doesn’t even make this data available. I don’t know of any social network that does. 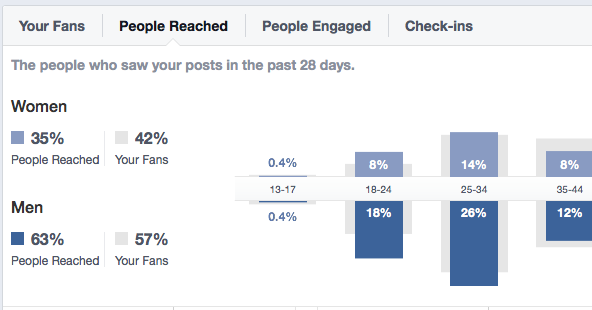 But since we know our Reach on Facebook, we scrutinize the hell out of it. 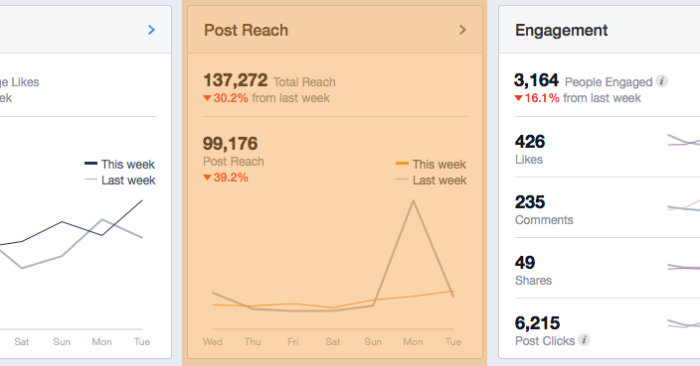 If you didn’t know your Reach, you would — I hope — focus on the metrics that actually matter. The metrics that lead to your business goals. The metrics like post shares, link clicks and conversions. Instead, we’re stuck in this endless loop of Reach fury. Reach means very little because it is rarely a good indicator of success. 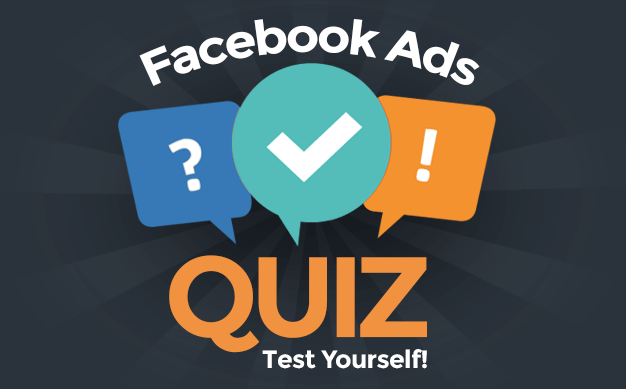 If you’re an advanced Facebook marketer (and I know you are! ), you measure things like traffic to your website, leads and purchases that came as a result of your efforts on Facebook. If you follow your metrics closely (and I know you do! ), you know that a high Reach doesn’t guarantee these things. If Facebook shows your posts organically to those who care most about your content, it should result in high efficiency. It cuts out those who otherwise ignore you. On Cyber Monday, I created a Facebook Offer. I spent $200 to reach about 9,000 Fans, resulting in nearly $2,000 in direct revenue. I also spent $30 to reach more than 85,000 non-Fans, resulting in not a single sale. If I put my head down when you complain to me about Reach, this is why. I’m tired of hearing about it. Show me that you’re beyond Reach. If actions that lead to your business goals are down, that’s something to be concerned about. Now, I do see some value in Reach. But the way we currently use it is all wrong. And the reason for this is a shift in the typical content publishing strategy. We focus on Reach on a post-by-post basis because “back in the old days” we were told not to post more than once per day. Sometimes, only a couple of times per week. So the Reach of that one post mattered. We put all of our eggs into that one basket. But we don’t do it that way anymore. We know that if we post multiple times in a day — as long as we do it strategically — we can see huge benefits. I often see 15 posts or more per day from some news Pages. When you post multiple times per day, your post Reach really doesn’t matter anymore. Your goal is to reach as many relevant people as possible in that day — or even week. The individual post Reach wasn’t very good for three of these posts in particular. For one, I reached a number that was only 8.6% of my total Fan base. 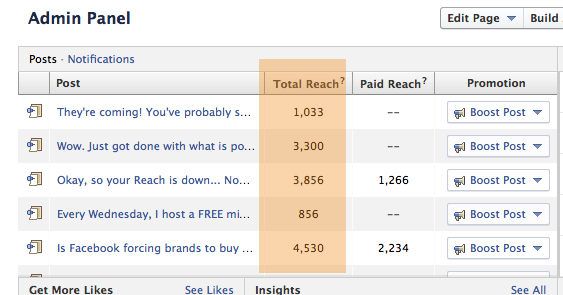 But if I look at my Daily Organic Reach (found in the Page Level Export), I actually reached 6,709 people that day. This number was 26.8% of my total Fan base. That week, I reached 17,468 people organically. This number was 70% of my total Fan base. You see where I’m heading here? If we stop micro-managing our Reach on a post-by-post basis, we might actually see that we reach far more people than we originally thought. It just might be over a day or week. If you’re realistic about user activity and how often your Fans actually want to hear from you, doesn’t it make a whole lot more sense to be looking at these numbers in this way? When you report your results to the CEO, do you think that he/she cares what your Reach was for an individual post? Or is the bigger picture that you reached X number of people in a day or a week more important? I know how I feel. But I know this takes a major shift in expectations to convince many to join me. The raging mob will tell you it’s time to revolt. I stress caution. Look at your numbers. Look well beyond Reach. Commit to fully understanding the Facebook ecosystem and what an effective strategy looks like. I’m passionate about this because I consistently see results. I have clients who consistently see results. And there are countless others who do, too. The truth is that a successful revolt may be good for Facebook. It’s certainly good for the marketers who stick around. Remember that competition that kept you out of the News Feed? It just got a little less competitive. So, I’m not appealing to the mob. They will continue to be unreasonable. They are obsessed with stats that don’t matter. They don’t want to put in the hard work, and they want to point the finger when their efforts aren’t working. But that’s not you. And I want to be sure you trust your instincts on this. Need More Help With Reach? 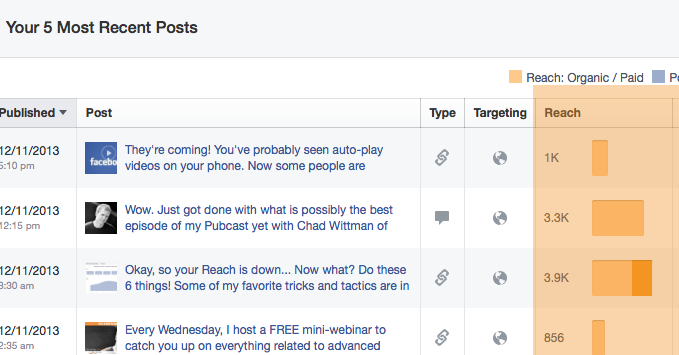 I’m creating a comprehensive, step-by-step training course on Facebook Insights that will help you fully understand your metrics. Reach is just the beginning! You can pre-pay now and get the course for half off, but when the course is ready (very soon!) the price will double. Go here to learn more!